Usually Lilah and I sit in the third row from the back when we go to church. Right in front of the family with the little boy and the new baby. This Sunday, we snuck in late (that's also usual...) and Lilah chose the very last row. The other family snuck in even later and sat in front of us. While the minister spoke about this season being about a little baby... I started really observing the little baby right in front of me. When it is your own baby, you are so completely exhausted and overwhelmed... I've never had the chance to just watch a baby sleep before... without the "mom thoughts". She was so - complete. I mean, not only was her little face so perfect, but she had everything she needed. She was wrapped up snuggly, had her mom and her dad and her brother right next to her. She was completely at peace. I didn't even realize I was drawing her at first. (I found out later her name is "Phoebe"). My mind went from the significance of babies at Christmas to babies at New Year's. Just as Santa has taken over "the Holidays," parties, champagne, the New York Apple, and Resolutions have taken over New Year's Eve. But I remember when I was little, the animated cartoon was about an old man and a new baby. It was very important that the Old Year be respected and acknowledged, and celebrated. It was just as important to make ready for the New Year - the excitement of the new baby and all the possibilities. In the past few years, since my family split, I have had the lesson reinforced that children are not "ours" - they don't belong to us, like possessions. They may be treated like household belongings by the court, but we really only get to borrow them for a short time before they move on with their own lives. Having my children with me is a privilege. Even when they drive me crazy. And watching this little baby sleep in her bucket, I had the weird idea that time... each New Year... is a lot like a small child. We can't hold on to the time. We can't set crazy expectations of what we will accomplish or create out of that time. And it doesn't help to wish we had MORE time - or that the child would stay little. But we CAN enjoy each moment and appreciate having the time we have. I like the idea of sharing our joy, experiences, creativity and new knowledge - rather than setting "resolutions" and goals that just leave us disappointed at the end of the year. It's not a competition. "Why I Like Dead Flies" - that was the title of my application essay to Brown University. When I was 8 years old I decided I wanted to be just like Indiana Jones when I grew up. (Except, a girl, of course). There was only one book available, with color pictures, about Egypt and that was from Time/Life books. It was enormous. I knew every photo by heart. I kept notebooks with diagrams of tomb layouts. I learned the basics of hieroglyphics. I dug up my grandmother's lawn. I obsessed. That year, my mom took me to Washington DC to visit the Zoo and The Smithsonian. My heart almost stopped when I learned that the King Tut exhibit was visiting. The line wrapped twice around the Gallery. There was no way we could get in... my mom said, "You'll just have to wait and see it in Egypt." I talked about Egypt and being an archaeologist so endlessly that I infected my father who also had a passion for history. He eventually gave in and, when a period of relative calm occurred in the middle east, he took the chance for an adventure of a lifetime. Or in my case, three adventures now, or maybe I've had three lifetimes? I was 12 that first time. And I will be forever grateful to my dad for taking the leap. The magic was still intact. When I visited a few years later with my college professor, so much had changed. And when I returned 20 years later, it was almost unrecognizable! Seriously, they had PAVED the Valley of the Kings (where Tut's tomb is) and made tourists ride in little trams (like they have at Disney in the parking lots). I don't think I know an expletive that could express my true feelings. Then there are the four lane highways, the smog and the trash... but this isn't really what I wanted to tell you about. And off to college I went with a love of Egypt and books and a new role model in the form of Amelia Peabody, the "indomitable Victorian Englishwoman" and "intrepid Egyptologist". Her "gorgeous, irascible archaeologist husband Radcliffe Emerson" and their "obnoxiously erudite son Ramses" set my standards for what I expected from my own future family. Weirdly enough, my own son, Alexander, is an awful lot like Ramses! (Ramses grows up to be a really great person, don't worry). And looking back, I can see why my own marriage was doomed - how could any ordinary man compare to Emerson? At Brown, I got to meet Zahi Hawass, the Director of Antiquities in Egypt. If you have ever watched any of those Egypt specials on the History Chanel, they always interviewed Dr. Hawass. But I was also immersed in some very dry studies of ancient grammar. Too many languages that made no sense to me. History that went... backwards? (B.C.) Chronology, reigns of pharaohs, terminology, classes led by lifeless, nerdy grad students... OMG what am I doing here! I realized I wanted to dig! I wanted adventure! I wanted to draw! I dropped out and went to NYC. (That's another story). But I also learned that Elizabeth Peters was really Barbara Mertz, a real-life female Egyptologist with a real PhD. She had written tons of scholarly type books about Egypt too, like Red Land, Black Land. And when my sister started her mystery book company, Sherlock and Co., and I started my murder-mystery rubber stamp company (Bartholomew's Ink) - we frequented the Malice Domestic Mystery Conventions. At Malice, I learned that this woman ALSO wrote the Barbara Michaels gothic mysteries that I loved! That last book, A River In the Sky, takes place in Jerusalem. I read it while I was on my trip to the Middle East a few years ago. One year, I carved a rubber stamp for Barbara of her logo - Isis with her wings outstretched holding a martini in one hand and a chocolate bar in the other. I wanted her to remember me as more than just another fan. Time passed. I sold my stamp company to Stamp Francisco. We moved back to New England. I lost touch with the mystery world and had little time to read long books with no pictures after my kids were born. I stopped reading Kmt Magazine (Yes, there is a magazine for Egypt freaks... ahem... scholars). Occasionally I wondered why I hadn't seen any new books by Barbara. My mom, bless her heart, still reads books with no pictures AND Kmt Magazine. She showed me the latest issue (Volume 24, Number 4) which explained that Barbara Mertz had died from Cancer in August this year. She was in her 80's and had an amazing adventure of a life. I am sorry that I never got to take a trip to Egypt with Barbara, but mostly I will miss Amelia Peabody. And Emerson. And Ramses. And all the other characters that were like family to me. Above is a very bad scan of a postcard. The original art was 18x24" - white and flesh colored pencil on black paper. 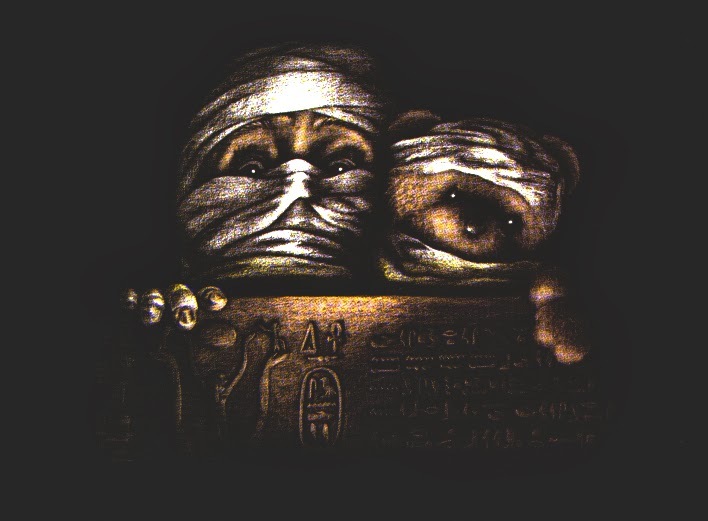 It's a self-portrait of me and my bear, Longfellow. I still love that piece. I used it as my business card for ages. 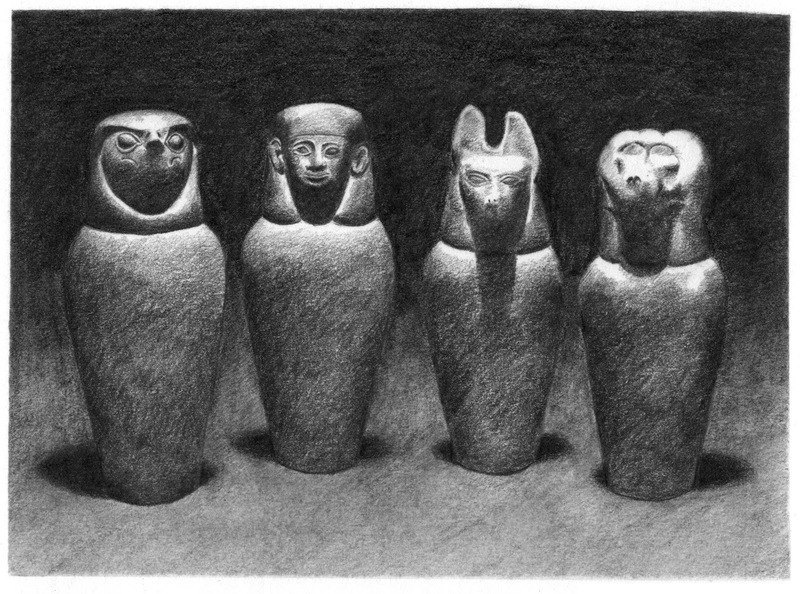 The one below is a pencil drawing of canopic jars. Hearing the news about Barbara Mertz' death is kind of like walking into a closet door that I was so used to walking past, that I had forgotten it existed... until I cracked my head against it. Now I can't resist poking through all the books and boxes and drawings and photographs that were stacked inside. It feels like someone else's life! But I can't stop thinking what to do with these treasures that I've unearthed...? 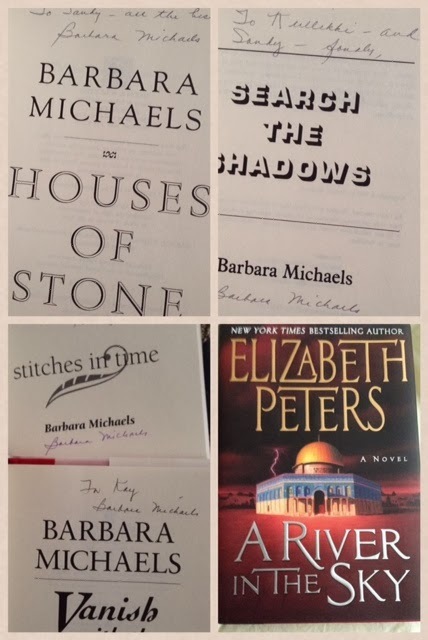 Note: The Barbara Michaels series of books were the "spine-tingling" ghost-mystery sort of books. Oooo I love those! Barbara just sent me one final chill... I went to her website, MPM, to find a link for you, in case you want to know more. It said there that she died on "August 8". I got serious goose-flesh.... take a look at the inscription that my mom wrote in Lion in the Valley... yes, I first "met" Barbara on "August 8". It started as a "great idea" - as they often do... and turned into a major project! Now my eyes are starting to cross from staring at the screen and I realize I haven't eaten anything since... wow... it's been more than 7 hours! I think it is time to call it a day, post the new ebook, and go watch some "Vampire Diaries" to relax. Over a week ago, I decided I wanted to create a new tangle, as a gift, and post it on here to wish you all a wonderful holiday. Seemed simple enough, right? 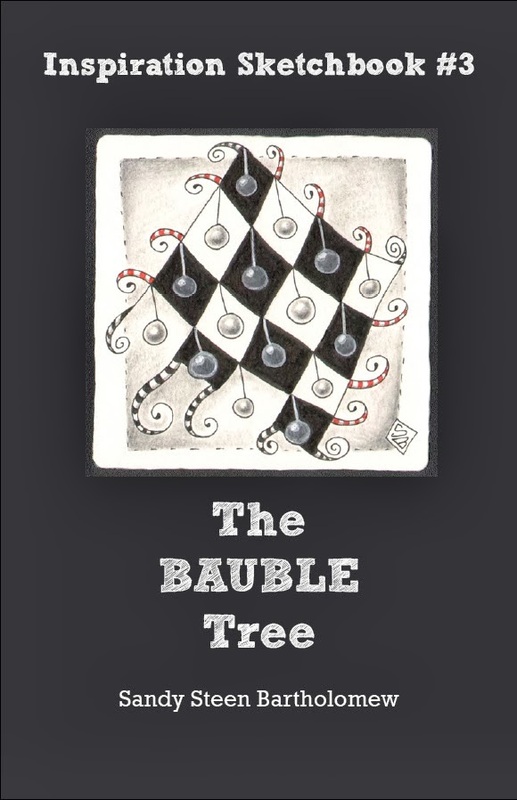 So I created the new tangle, called Bauble, and then thought it needed a tangled Christmas Card to go with it. If this is sounding like the book "If You Give a Mouse a Cookie" - then you can see where this is going. Although no cookies were involved. Yet. Bonnie did leave some yummy looking cookies that will be my reward for finishing this!! The image for the "card" grew... so I decided to take step-by-step photos of the decisions and process. I took some more photos as I added the shading... then Lilah (my little Art Director) said to do it over in color (!?) So, of course, I did. More photos. "Hmmm," I thought, "maybe you folks would be interested in seeing the steps involved?" So I laid it out in InDesign and made a pdf. And it turned out to be 35 pages long. Whoa. So I added tips and instructions and thoughts... and it kind of turned into a little book. I asked my sister and Bonnie to take a look and say if it is OK to post. My sister has probably already gone to bed, and I don't want to wait until tomorrow, but Bonnie gave it the thumbs up. I love it. It's a great tangling adventure and worth $8.50 for sure. It's a great source of information on color, shading, and design and such a relief after looking at all the tiles posted for the class I took. It puts the fun back into tangling. That sounds like a thumbs up to me. 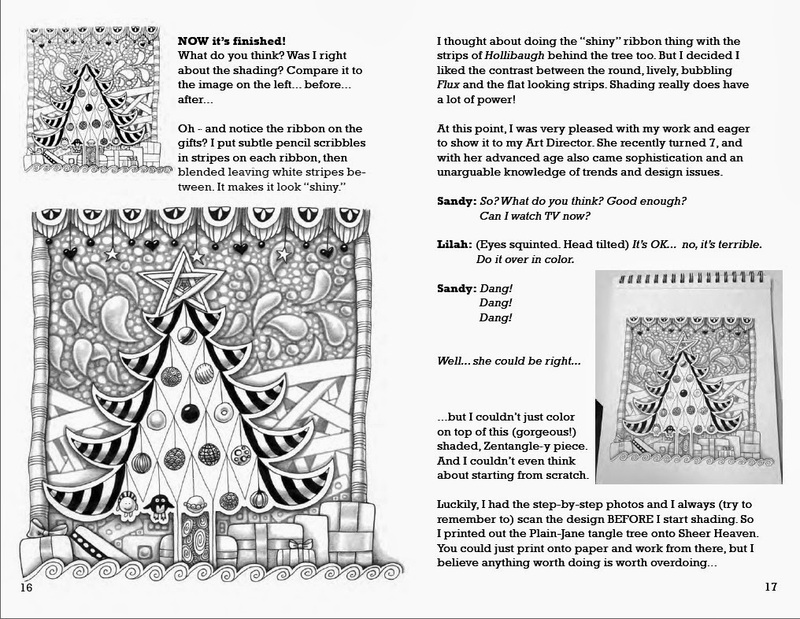 I've posted the new ebook, Inspiration Sketchbook #3 - The Bauble Tree on Etsy and on my Wazala shop. If you'd like to pay full price ($8.50), you can purchase it on Etsy. But since I love you all and can't send every one of you hand knitted socks, I CAN give you a special code so you can download the ebook from http://bumblebat.wazala.com for just $1.00 (until December 25, 2013) The special Holiday Super-Secret Code is: V7FVMBN547. 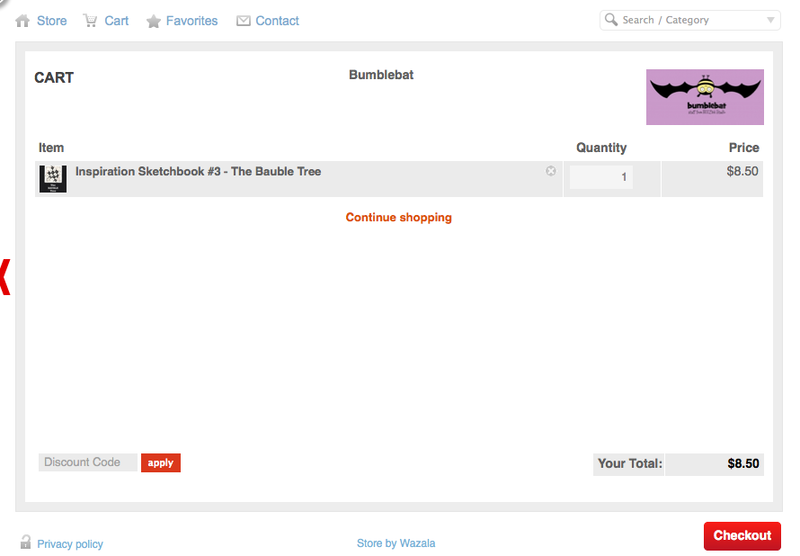 Be sure to enter it into the right spot in the shopping cart when you check out or it won't work! After you pay, you will receive an email receipt in your inbox from Wazala with the download link in the receipt. 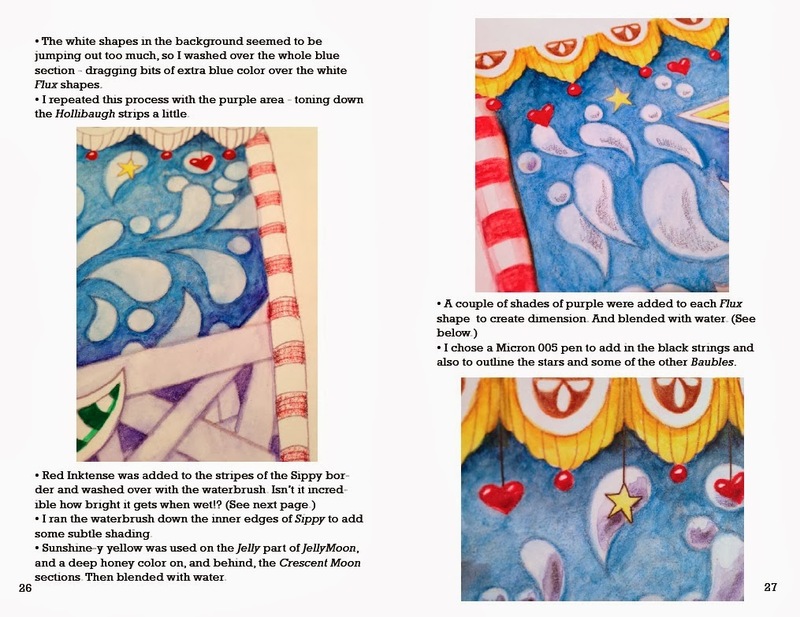 Yes - the images in the ebook are of Christmas trees... or Holiday trees... but there is nothing religious about the book and it is actually about composition and shading and coloring and could be applied to any artwork you do. And any season of the year. Even NON-tangled art. Gasp. I hope you enjoy it tremendously! And if you make something cool or it helps your art in some way, I'd love to know! Time to step out of the bat-cave and open those studio doors up! 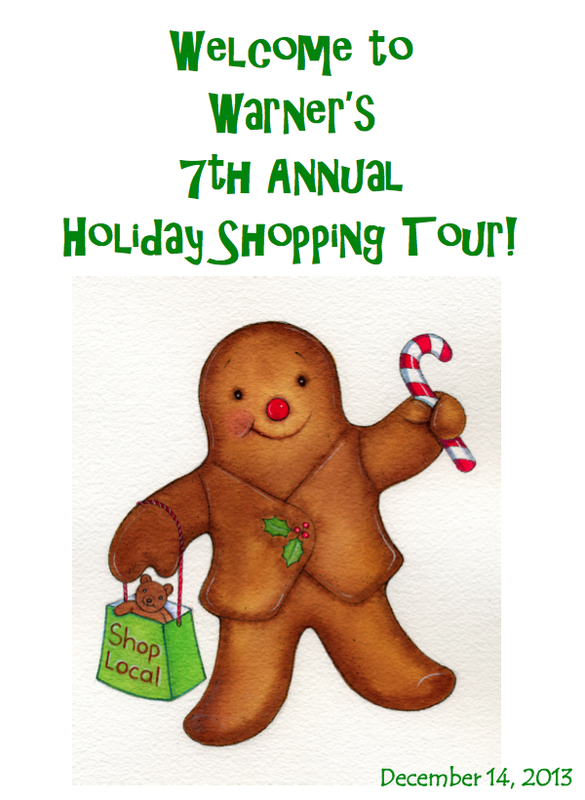 I hope you will be able to come and visit The BeeHive on December 14th or the 21st. 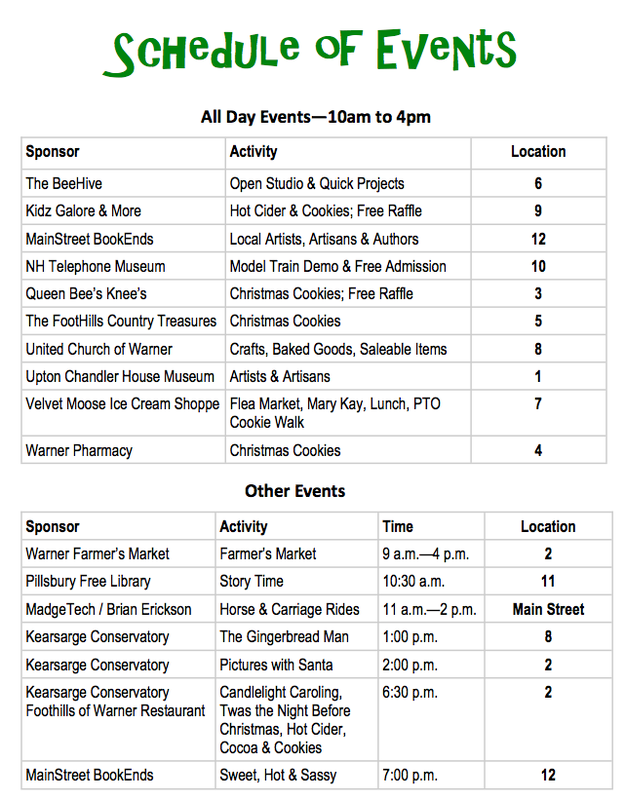 There are lots of fun things going on around town on Saturday! At The BeeHive, we'll be decorating cookies and maybe some ornaments or something. Lilah will be in the studio and she'll probably want to teach you how to draw Lilah Beans if you let her. We will also have some great Zentangle for Kidz! Kitz available... I'll get those onto the Etsy site soon too. I've got all the Zentangle books and a whole bunch of new art and craft books and many older ones that are on sale. Bonnie is mastering the process of how I like to mail out orders - ie: notes on the orders, little goodies in the envelope... I stress that MORE is always better when including goodies. I realize that she has embraced this concept when I have to reorder stickers and tattoos a few weeks later. I like to stamp a hand-carved Lilah Bean on the envelope. I like to stamp a hand-carved Lilah Bean on the envelope. AND she has to have pink cheeks and "tangled" hair. I keep a pink Prismacolor and Sharpies near the shipping table just for this purpose.